summer months in the Flathead Valley there is plenty to enjoy with the endless nature, exciting water sports and intriguing towns to explore. However, there is one event that locals and visitors don’t want to miss. The Polson Main Street Flathead Cherry Festival will take place on Saturday, July 16 and Sunday, July 17 in downtown Polson. Event Founder Jackie Cripe said there are more vendors signed up than last year and six Flathead Valley cherry orchards will be represented. Held each July, the event has grown into one of the largest festivals in the state, drawing crowds of around 8,000. In addition to showcasing local stores, products, the area’s natural beauty, and recreation opportunities, the event brings more sales to local businesses than any other weekend. This year’s festivities kick off at 9 a.m. Saturday, July 16 and the following day at 10 a.m. Families and friends can enjoy the variety of activities while browsing more than 110 vendor booths set up for the event. On Saturday, bagpipers will entertain the crowd beginning at 1 p.m. before the kids’ cherry pit-spitting contest at 2 p.m. Following that, adults can race to tie a cherry stem in their mouth at 4 p.m.
On Sunday, those who dare can enter their best food item made from cherries, such as cherry barbecue, cherry glazed bacon, or even homemade cherry ice cream. Judges will pick the best and most unique cuisine at 1 p.m. A children’s pie-eating contest starts at 3 p.m. Adults can get their chance to gorge on a cherry pie at 3:30 p.m.
“The contests can get pretty heated between the talented local chefs,” Cripe said. “We are hoping to get more people involved in the competitions this year.” Anyone interested in entering a dish can meet at the Cove Deli at 1 p.m. on Sunday, July 17 with enough food to feed four hungry judges. Not only do event goers get a belly full of food, they can enjoy catching up with old pals as well, according to Cripe. 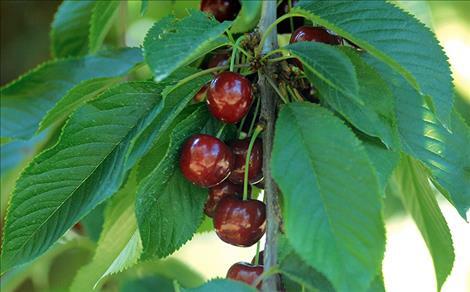 “We have the cherries on the east shore of Flathead Lake, all the vendors come and show new products, and the Cherry Festival has just become a tradition,” Barrett said. Semmens is mostly impressed with the amount of out-of-towners that attend. The event is family friendly and Cripe encourages people to check it out. Cherry festival details can be found at www. flatheadcherryfestival.com. When: Saturday, July 16 from 9 a.m. to 6 p.m. and Sunday, July 17 from 10 a.m. to 4 p.m.